EAA AirVenture keeps these two Tri-Motors flying almost around-the-clock during the week-long event. One of the things that irks me the most about writing is the neat stuff that gets left on the cutting room floor. Oh, sure, by the same token, as an editor and proofreader, I also derive a satisfaction from knowing which words, sentences or anecdotes to excise while minimizing impact on the story. But sometimes you have to snip out some real cool factoids, like how a Tri-Motor like this one I shot at EAA AirVenture this year was once used as a school bus. It was an apocryphal tale my dad had repeated to me over and over through the years, about an ancient Ford airplane being used up until the ’70s to ferry children from an island somewhere in the Midwestern U.S. to a mainland elementary school, since there wasn’t a boat for some reason or another. So when compiling my reporting on this year’s Oshkosh air show (and Ford’s involvement in it) for my new publication, the National Post’s Driving.ca, I decided to look it up to see if dad had been onto something after all. And sure enough he had. There’s nothing hard-and-fast on it, but across the internet you’ll find mentions of an Ohio-based Island Airlines flying the Tri-Motor from some remote Lake Erie island townships into Port Clinton as, yes, a school bus, the ’30s-era plane apparently being the only public transit on and off said islands. Imagine taking this every day to and from school with nine other kids? The other story that didn’t make the cut? 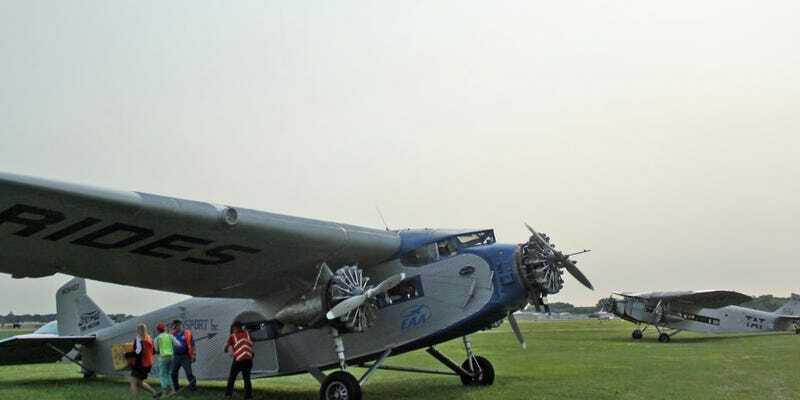 The EAA’s own Tri-Motor, the Eastern Air-liveried plane above, was blown over and nearly destroyed in a windstorm in 1973, and its restoration was aided by another Tri-Motor the organization sourced and used as a frame jig. They had found that plane down in Mexico, where a family was using it as housing. A little chimney poking through the roof, worn paint down the fuselage—like a trailer home but with a cooler back story. The EAA bought the family a much-nicer hut and took the Ford back Stateside. They’re neat stories! But they simply didn’t fit the flow of my already-over-word-count article, and so now you’re the only people I get to tell them to. That’s how writing for a major publication goes sometimes. EAA founder Paul Poberezny’s old Buick was up until the past few years how the organization got smoke oil out to the flight line. I love it. Of course, I had to stick it in my gallery about the cars of EAA AirVenture 2018, but, hey, at least I got to share it. Anyway, I know haven’t posted here since last year. The move to the new publication has been good, but time-consuming. I also write fewer features there than I used to, and instead focus on churning out news and social media posts. That said, I have had the opportunity to write about how a car gets into the Museum of Modern Art’s permanent collection (I’ve been wanting to do that one for forever); went on my first real press reveal (the 2019 Lexus ES in California); and the designer of the Callaway Corvettes even doodled a sketch for me. I’m not sure if I’ll have more time to post here again on the regular, but I’ll try. It sounds like they like my feature writing and want me to do more, which will mean even more fodder for this behind-the-scenes blog. I’ll keep you posted. See you guys after the Cobble Beach Concours d’Elegance and the Maple Mille tour this month!